Fiddleheads belong to the family of ferns. The fronds resemble a fiddle before they open hence the name. These are basically wild ferns and can be found all over the United States. To collect them you can check near creeks or springs. These ferns taste like asparagus or even broccoli. Fiddleheads have a onion type of chaff covering over them. This has to be removed prior to cooking. Raw fiddleheads taste bitter and should be preferably consumed after cooking. They can also be procured from farmer stores in fresh or frozen form. Before cooking, there is a requirement of cleaning the fiddleheads thoroughly since they carry bacteria. During cleaning all chaff should be removed and the ferns should be rinsed under running water to remove the dirt and other substances on them. After cleaning, cut off all stems two inches from the head of the fiddlehead. You can now either boil or steam the fiddleheads. For boiling, place the ferns in a stockpot. Fill water in it till the ferns are covered. Boil till the fiddleheads become soft then drain out the water. Add salt and pepper to taste and serve. You can serve it as a side dish along with meat. This is another simple dish to make. 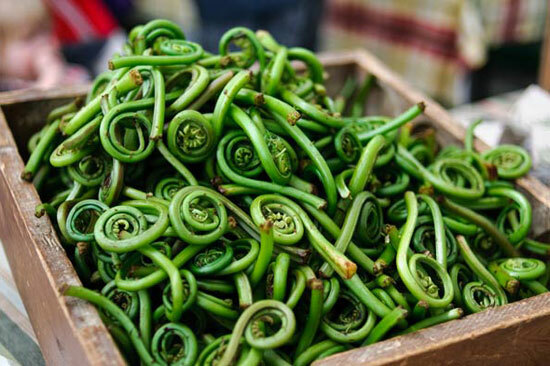 After the fiddleheads are clean, take about 3 tablespoon of butter per 1 lb of the ferns and melt it in a skillet. Keep the heat at medium. Once the butter has melted, put the ferns into the skillet. Keep stirring so that the butter and heat softens the ferns and makes them tender. You may serve this dish hot. Some people eat Fiddleheads as salad. However, there are chances of bacterial infection by doing so. Tighter fiddleheads cook and taste better. These ferns can also be cooked with other greens and in sauces and soups. Using white cream or wine sauce, fiddleheads can be cooked with morel mushrooms. Being a wild fern, cleaning the fiddlehead is very essential before cooking to prevent any harmful bacteria entering the digestive tract.